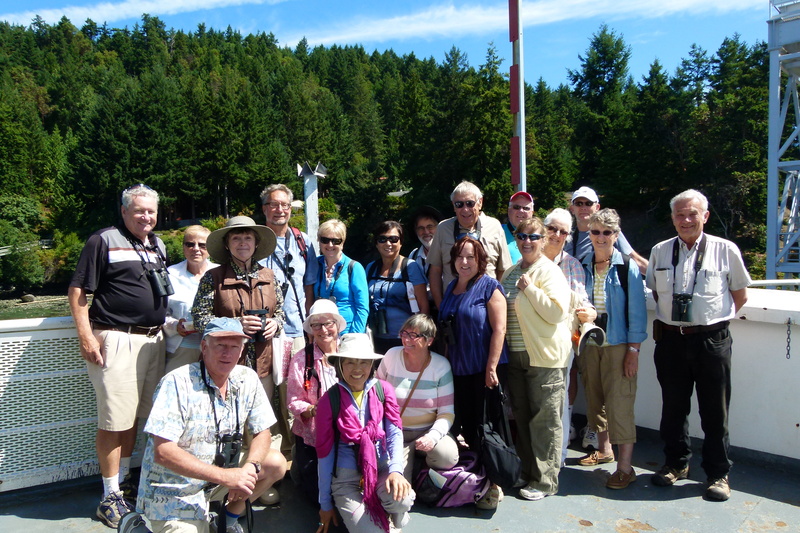 Nineteen DNCBers met on the Salt Spring Ferry round 10:00 a.m. on Wednesday for our all-day Island Ferry “Birding” Outing. It was a glorious day and it was a wonderful Island Cruise, but we didn’t see a lot of different bird species. Some hi-lites included: Rhinoceros Auklets, Pigeon Guillemots, Bonaparte Gulls, spectacular scenery and scrumptious ice cream in Ganges. 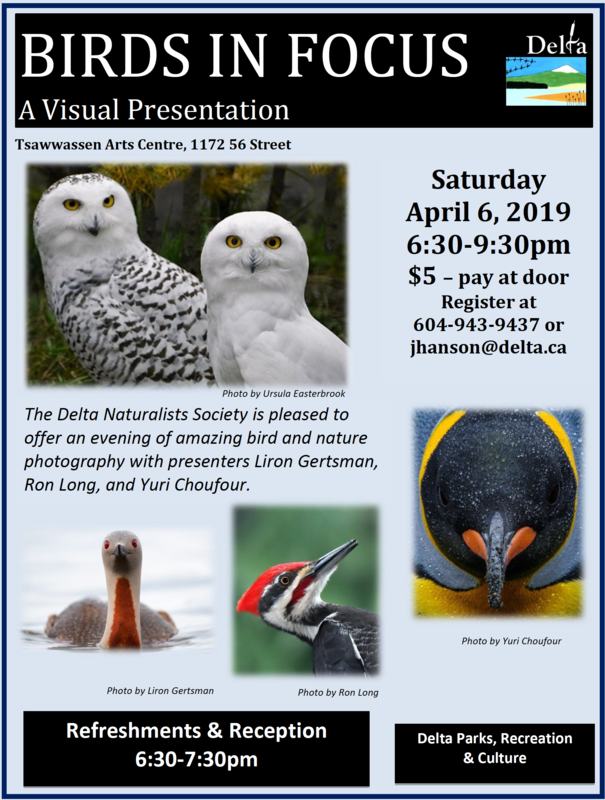 Check out Terry’s and other’s photos on the Picasa site link. For comparative purposes, check out my more interesting Report 2012-44 of our Ferry Trip on Oct. 10, 2012 at https://dncb.wordpress.com/2012/10/10/dncb-outing-no-2012-44-on-the-gulf-island-ferries/. The nineteen made sporadic boardings prior to setting sail, and pre-departure birding around the terminal was pretty good. 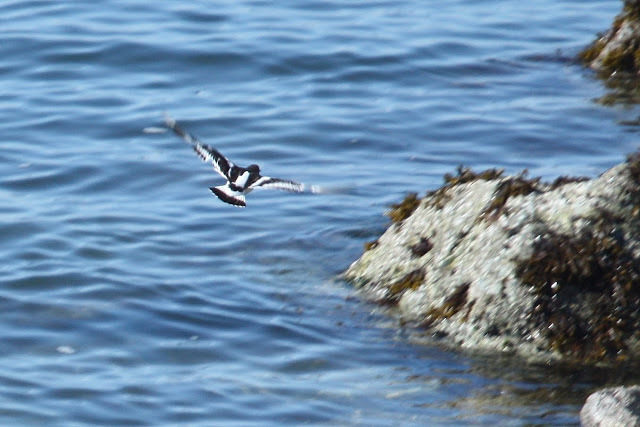 The Black Turnstones were around as were the Harlequin Ducks, a Whimbrel, and lots of Harbour Seals. On departure, several participants enjoyed the White Spot breakfast on board as we crossed the Strait toward Active Pass. Some saw Harbour Porpoises in the Strait, but one very interesting sighting was a Hummingbird (Rufous?) that darted past us way out in the middle of the Strait. 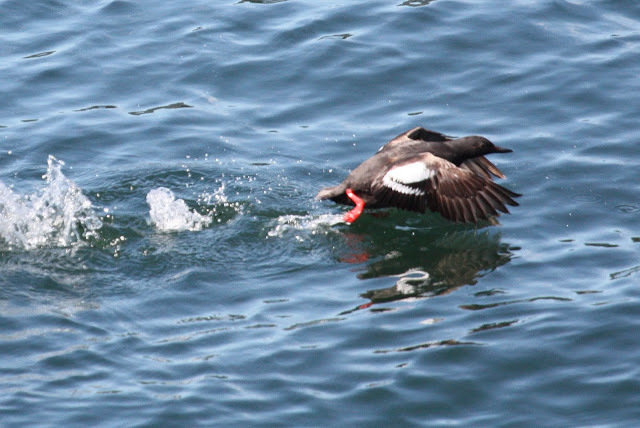 We also saw a Rhinoceros Auklet, but got closer looks at this species later. Through the Pass, we saw several Pigeon Guillemots diving, and landing on the rock cliffs (probably nesting there). 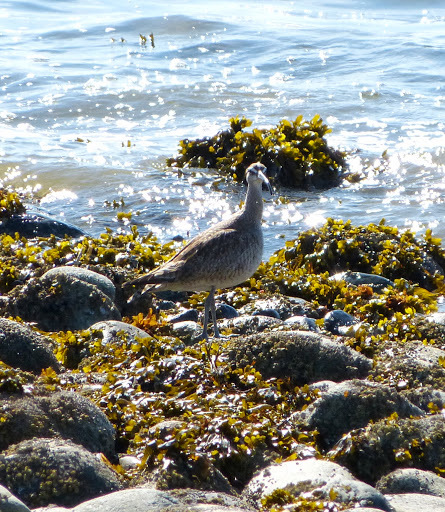 Our first landing port was Sturdies Bay on Galiano Island. 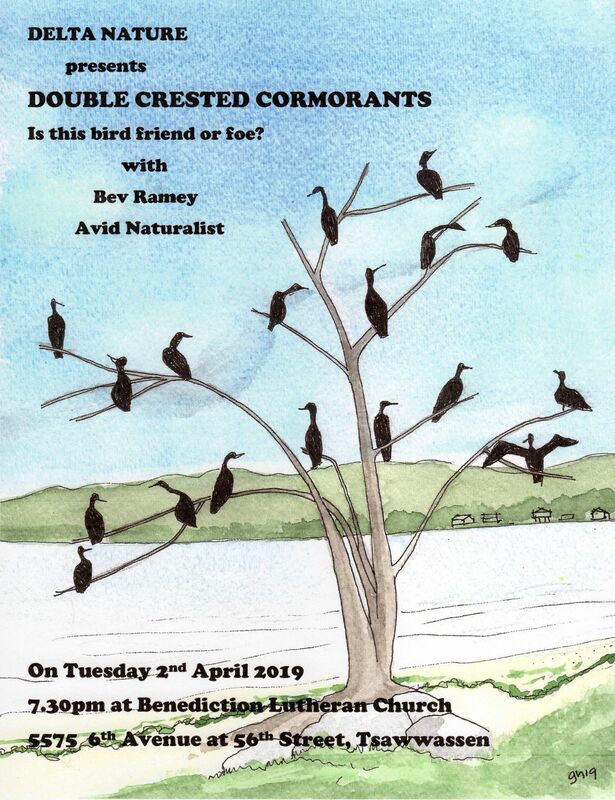 We saw our first of several of Lorna’s Belted Kingfishers here. Kingfishers seemed to be at most ports. We also saw lots of Pelagic and Double-crested Cormorants. We delayed taking our Group Photo here to give Gerhard time for his nap on the upper deck. Roger conned another passenger to take our Group Photo at Village Bay at Mayne Island. Nothing different (except a Mink) was spotted on the way to Village Bay or to Otter Bay on Pender Island or to Long Harbour on Salt Spring Island, our 4th stop. But everyone stayed outside mostly at the bow enjoying the gorgeous scenery. At Long Harbour, we rushed off the boat to line up to take the small community bus to idyllic Ganges town. It was late arriving, and only took 24 passengers. We were 25 (with 6 other tourists who butted in), so the martyr Roger decided to walk to Ganges. He just made it in time to catch the next bus to Fulford Harbour. At Ganges, some enjoyed a beer in the hotel; others had soup, sandwich and/or beer in another restaurant. I met Sandra, daughter Erica and friend Sonia at Aunty Pestos, an awesome (according to Sandra) restaurant on the water (Roger, Mike and I had a beer there on our October outing when it was called the Local Pub). In the bay in front of the restaurant was a family of Mute Swans (5 Cygnets). Anyhow, for some reason, our time in Ganges was much shorter than last October, so I only had time for an ice cream cone before catching the 3:05 p.m. bus to Fulford Harbour. White Rock Al and two other White Rock newbies, Pauline & Colleen, along with Gerhard and Kay decided to stay in Ganges until 5:00 p.m. That was a helpful decision as our community bus was again packed, with no seats available. At Fulford Harbour, somehow we lost Jane and her friend Louise, so I think we were twelve on the ferry crossing to Swartz Bay. The Trip Leader obviously lost control, but he really enjoyed his second ice cream cone (Bubble Gum) at the ferry dock. We (Lorna, Roger, Mike, Sheila, Jackie, Bill, Anne, Terry, Deborah and me) caught the 5:00 p.m. ferry back to Tsawwassen. You will note that’s 10 participants. Moira left us at Swartz Bay, but I have no idea where the other participant went (or who it is); I’m awaiting Roger’s Group Photo for ID confirmation). The ten spent most of the time at the bow, when it wasn’t too windy. 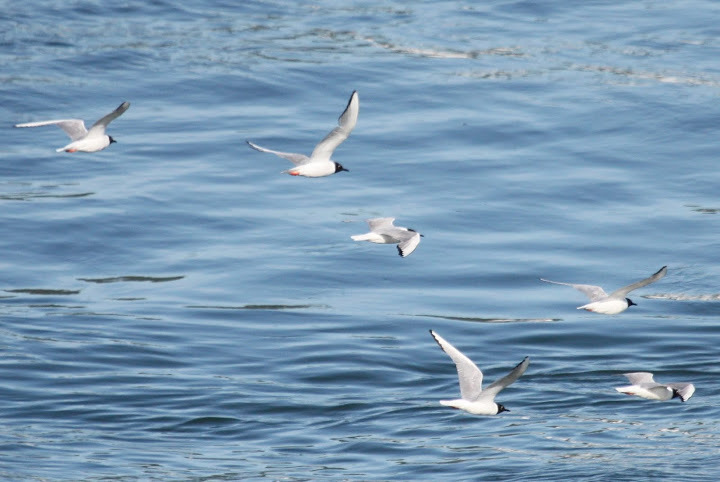 We saw more cormorants, a few Harbour Porpoises, rhinos and guillemots, and a beaut flock of Bonaparte Gulls in their “black-headed” plumage. There was also another flock of Bonies in non-breeding plumage with no black on their heads; interesting stuff. Anne also tried unsuccessfully to teach us how to identify Gulls; apparently there were Mew, Ring-billed, Western, perhaps Thayer’s Gulls along with the resident Glaucous-winged seen along the route. We saw several Whale-Watching boats, but I think they were going back to their home ports, so we did not see any Orcas. We arrived at the Tsawwassen terminal at 6:40 p.m. , took the shuttle to the Tsawwassen First Nations parking lot and drove home. Assuming none of the participants were “lost at sea”, I think everyone really enjoyed the outing. Nothing better than cruising around the Islands on a beautiful Summer day, and especially for Free (a perk of being old). 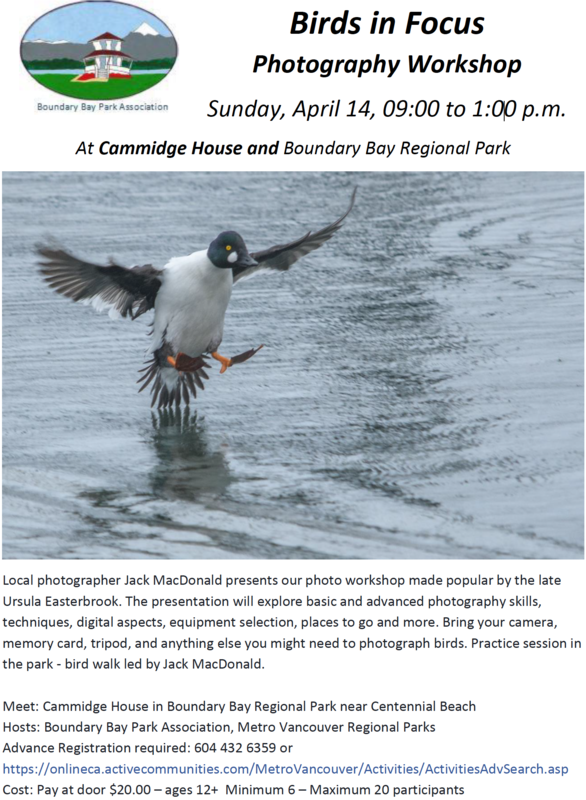 This entry was posted in *DNCB, Black Turnstone, Bonaparte's Gull, Galiano Island, Harbour Porpoise, Harbour Seal, Harlequin Duck, Mayne Island, Mink, Pender Island, Pigeon Guillemot, Rhinoceros Auklet, Salt Spring Island, Whimbrel. Bookmark the permalink.